Who would start a retail business these days? Running a physical retail business has become very challenging these days. Even the big supermarkets are finding it difficult but the ones feeling the most pain are the small retail businesses. Rising costs such as rent, rates, utility bills, staffing etc. contrast with falling sales revenue and tighter profit margins as the general economic belt tightening affects consumer demand. One of the biggest reasons for the downturn in trade on the high street though is the growth of on-line retailing. The big advantage on-line retailers have is the absence of many of the fixed costs of physical premises, the very costs that hit hardest when times get tough. So you can see the attraction of running an on-line retail business. But it’s not all rosy in the on-line garden! The big advantage of the high street retailer is their visibility and the passing foot traffic of potential customers. On-line traders don’t have this advantage. Websites are hard to find, just take a look at Google, Bing or Yahoo, thousands of results for a simple search when a customer is looking for something and very little chance of an impulse buy when they aren’t. So is on-line really the answer? Probably not, at least not if you go it alone. The costs of capturing enough visitors to make it worthwhile can be prohibitive. So is any retail business viable right now? Well the answer, surprisingly is Yes! If you go about it the right way. Physical retail businesses have increasingly gathered together first there was the village or town market. This developed into what we now refer to as the High Street or Town Centre. More recently we’ve seen the growth of retail parks and giant shopping centres. The more businesses cluster together the more customers they collectively attract. So it is on-line. In the early days of the web we had eBay and Yahoo shops, the modern equivalent of an on-line retail park. Many successful small businesses got their start in one of these and some went on to become large enough to stand alone with an e-commerce website of their own. There is one massive on-line retailer that many businesses, large and small, consider to be their main competitor – the retailer who’s rapid growth has eclipsed any other. That retailer is, of course, Amazon with a massive online presence and world-wide coverage. This behemoth is credited with (or accused of) changing the face of retailing forever and killing off many small retailers and even severely hurting even the large supermarkets. But there is a little known statistic that I recently came across that suggests that around 40% of Amazon’s sales turnover is not their own stuff! This huge chunk of what appears to be Amazon’s sales actually comes from an army of smaller retailers who operate in the Amazon market place. Amazon is not so much an on-line superstore but more of an on-line retail park or shopping centre. Amazon has created this huge shopping presence on-line and then shared it with other businesses thus giving them a ‘leg-up’ into a place they would struggle to be on their own. They all benefit from this amazing Amazon selling machine. By setting up shop in the Amazon Market Place you avoid the costs of retail premises, the cost of setting up an e-commerce store or marketing costs and avoid the time it takes to get a retail business up and running. If you use their fulfillment service you save on storage costs as well as packaging and delivery costs. You can also save on credit card payment services (including the hassle of getting approved) and a variety of other standard retail costs. Of course Amazon don’t do all of this for nothing but their fees benefit from being totally sales related whereas most retail costs are fixed regardless of sales levels. This almost guarantees a profitable business. What’s more you have an instant global market presence if you want to scale up the business. The above intro video above ends with links to more YouTube videos to help you get started. 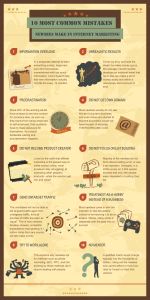 The 10 Most Common Mistakes Newbies Make In Internet Marketing – Click on the picture to view. One of the major issues of internet marketing is the number of aspiring new entrants to the market place that never really get started. 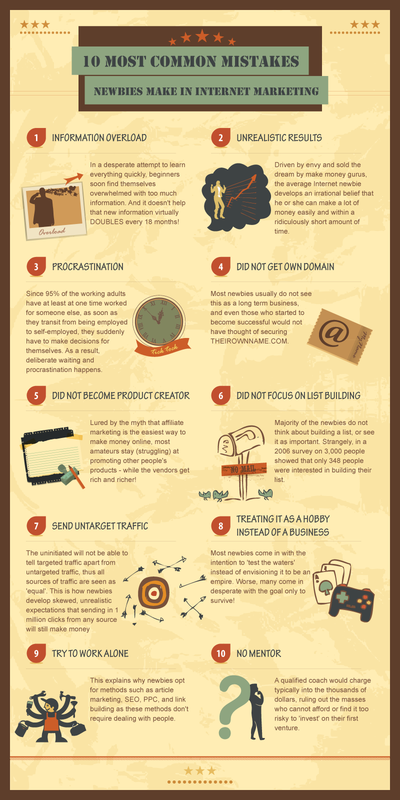 There are still way too many failures in our industry and a lot of the reasons can be found in this informative infographic. Just click on the graphic to view, then click again to enlarge. You know how effective TV advertising has been in the last 50 years, the only problem has been the cost! Small businesses and especially start-ups just haven’t been able to compete with the big corporates and their big budgets for TV advertising. Promoting your business on TV was just out of the question. Well now, thanks to the power of the internet and new video technology, anyone can promote their business using on-line video. What’s more, more and more people are watching video on the internet, turning their backs on TV with it’s mindless drivel and endless repeats. The good news is that what they are watching and enjoying is often home-made video! Just look at the popularity of YouTube, Google Video and other video websites. So, how can you as a small business benefit from this new marketing opportunity? Surely something this new must cost a fortune. Nope! I’m using video myself, in fact I did an outside broadcast with a friend at a local business exhibition recently – just as an experiment, and the results have been outstanding. We both had stands there promoting our respective businesses. Andy was marketing his video production business, Blow by Blow Productions and I was promoting my telecom business Marketing by Numbers. During a quiet spell after lunch we decided on impulse to take one of Andy’s cameras (any digital camcorder would have done) and I interviewed a number of other small business exhibitors while Andy filmed the interviews. Andy later edited the shots and I converted them to web video with some free software I had and put them up on both of our websites. We then emailed the links to the businesses we had interviewed and they put the links on their websites, and so did the exhibition organisers, the local Chamber of Commerce. Our interviewees are delighted with their free publicity and want some more video production work done, while Andy and I got lots of free traffic to our websites. Make no mistake – online video is going to be big! Jeff is giving away everything you need to know to make Quality Videos and how to Optimize them for Google! Herschy is the callsign of an ex F16 fighter pilot, Jeff Schwerdt. Jeff retired from flying following an injury and like many ex military men really knew nothing else. He got involved in internet marketing through through a friend and took an interest in online video, eventually starting his own online video business. Herschy has generated over $1 MILLION dollars in profits for his business and his personal clients combined in his FIRST 20 months online with multiple clients and products using Video Marketing and Free Advertising Strategies. Go get your copy right now while you still can! You’ll receive a 40 page report, Plus 2 hours of Training Videos, and a Traffic Generation Checklist. PLUS! This weekend he’ll be releasing another set of videos showing any newbie how to increase the audio quality of their Flip video Cameras in just a few minutes. That’s Free too. After months of testing on Google and YouTube, Herschy has developed this new strategic report on Video Optimization Strategies. The exciting thing is that Herschy has tested this over the past 20 months and generated over $1 Million dollars in sales for his company and clients with Absolutely Zero out of pocket costs to advertise. Not only does video yield consistently high opt-in rates, it has increased sales conversions, driven leads, and built a stronger customer relationship. In other words, it just works! Let me have your feedback in the comments area and tell me what you think of the report. I would also like to know how valuable or otherwise you would find similar reviews or recommendations in the future. If you’ve had any exposure to Direct Marketing or Internet Marketing, you’ll know that the most successful marketers put a lot of emphasis on building up their prospect lists. Why? Because it is much easier and much more cost effective to send offers to people who have already had contact with you than to keep advertising to total strangers. Direct Marketers keep tabs on their past and present customers and every enquirer is added to the list whether they buy or not. They also buy or rent mailing lists from list brokers or exchange lists with fellow direct marketers. Internet Marketers are somewhat limited in that it is not advisable to buy or rent email lists due to Anti SPAM legislation and the risk of their website being shut down because of SPAM complaints. However, they do have other ways to build their list. Just like direct marketers they have past and present customer data as well as enquirer data. The successful ones also make sure that they have a subscription or ‘lead capture’ box on their website. By far the best way for the internet marketer to gain subscribers to their list is by giving away something valuable in exchange for the website visitor’ name and email address. This usually involves setting up a lead capture page with a ‘Special Free Offer’ on the website home page linked to the lead capture page. Some marketers even have the lead capture page as their home page! This page is teamed up with an email program called an AutoResponder which collects the data and stores it in a databse for subsequent follow-up – the follow up mailings can even be automated by the autresponder. Needless to say, it costs money to set this up and run the autoresponder service. Many websites that manage to get listed in the search engines get little or no traffic. One reason can be that only the home page has been indexed in the engines but none of the others. This can be for a number of reasons usually attritutable to poor site structure and content. One way of helping the search engines to find all of your web pages is to provide a sitemap. The sitemap should be at level 1 on your site, i.e. in the root directory and should list and link to every other page on the website. The sitemap page should also be linked to directly from every other page on the site.